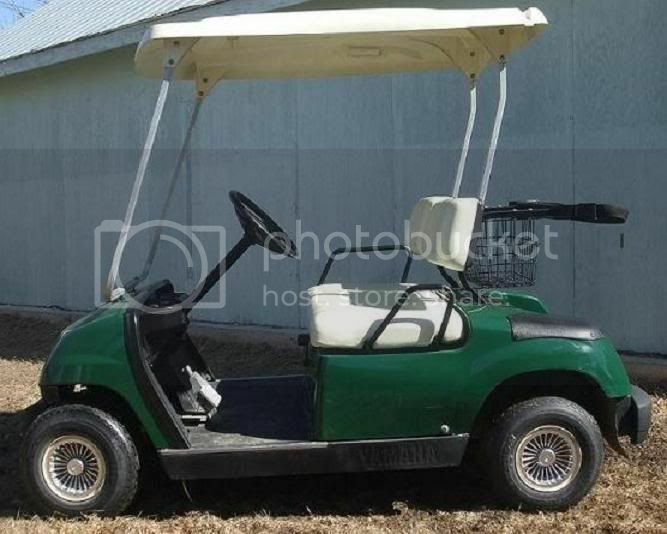 I've got my interest peaked on doing a 4 wheel drive conversion on my my 2003 Yamaha G22 golf cart. 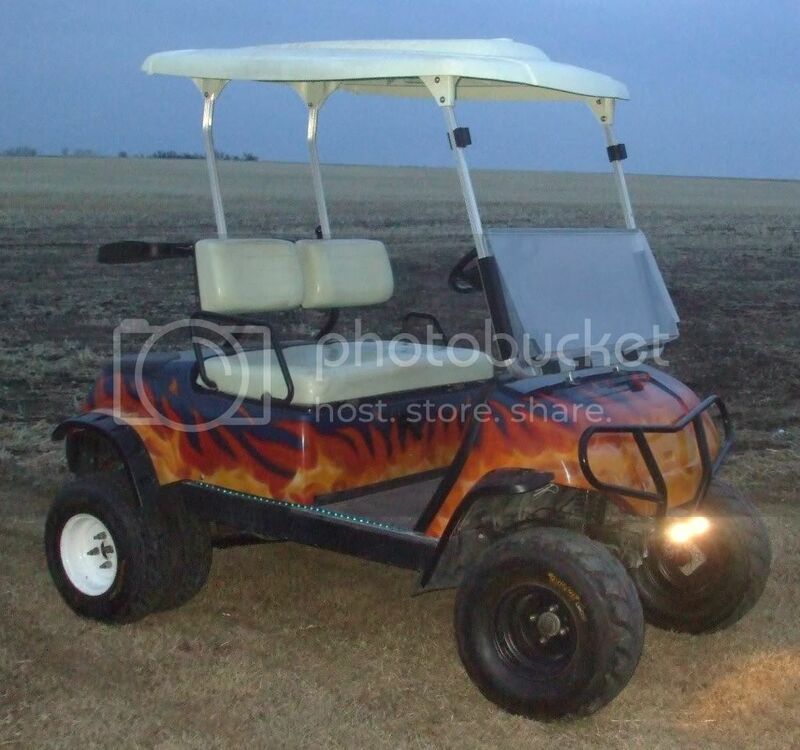 I did some searching around and can only find manufactured four wheel drive kits for electric golf carts. Basicly a hydraulic pump and four orbit motors, not what i'm looking for. Anybody heard of a direction to go in with gas carts as far as 4x4? So far I've 6" Jaked it, new rockers, Bush guard, Speed Racer 10-10-22 on front and dually 7-10-21's on the back, and made fiberglass flare-extensions for rear fenders to cover the dually's. 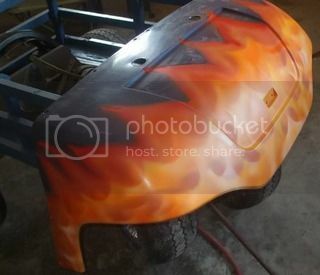 Painted metalic blue and the airbrushed flames from nose to a**! When I can figure out how to post pic's I'll show you. As far as posting pictures goes. My opinion is go to a free site like photobucket and get an account. Then upload your pictures to Photobucket, copy and paste the IMG code to your posts. To add the code manually just type in [img= directly before the address and [/img] after it. The main thing is getting the pictures hosted, you can't just add them from a file on your computer. BTW, you will see this on here a lot. Lookin' Good, I like the duallly look. Thanks. Not exactly professional flames, but I'm fairly happy with them. I've never painted something like that before, so I bought my own air brush, watched a few online examples and gave it a shot. Hunted all over for the tires narrow enough for the duals and still golf course legal. 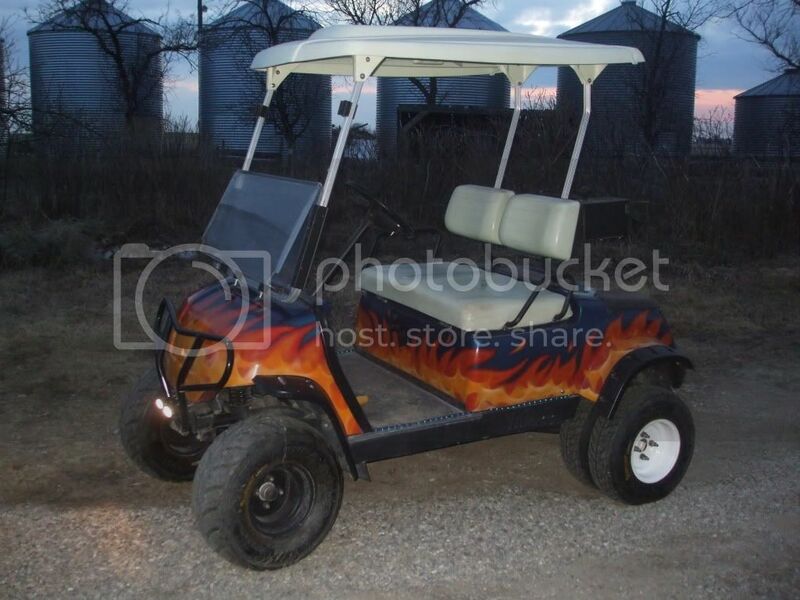 Turns heads on the course enough to just about cause whiplash. Now I'm interested in turning it to 4x4... Have any of you heard of a kit for gas engines or am I going to have to adapt the elect kit for my machine? Any Ideas would definately help. Thanks. I know this is an old thread but was wondering if anyone had figured out a way to convert a gas cart to 4wd as well.